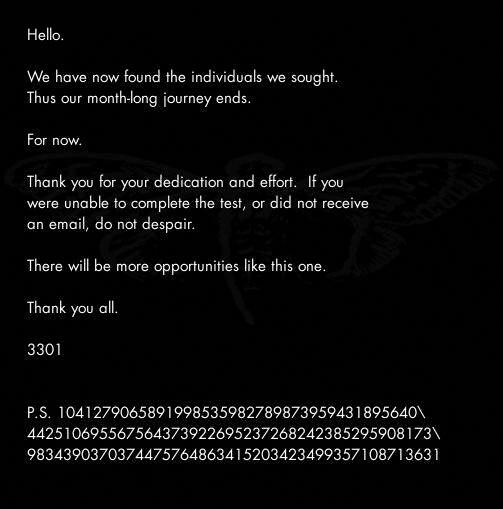 “Cicada 3301” cryptographic puzzle game played out on 4chan & reddit: best job hire in disguise? What does the Caesar Cipher, a picture of a duck, Mayan numbers, King Arthur, 2143909608, 845145127.com, GPS coordinates in Warsaw, Paris, Seattle, Seoul, Arizona, California, New Orleans, Miami, Hawaii and Sydney have in common? They’re all pieces of an online cryptographic puzzle game that began earlier this January. Not before long, groups of people from 4chan and Reddit pooled their collective intelligence with the goal of solving these puzzles which has included secret messages hidden in images, decrypting cypher-text using base-20 Mayan numbers, calling a US-based phone number. The last major development of the puzzle stems from 14 GPS coordinates. Participating players who visited the locations found a piece of paper taped with an unique QR code. No surprise that these codes led to more cryptographic puzzles which takes the puzzle to the darknet with TOR. Progress may seem to have come to a halt but that’s because the puzzles have become personal. One participant by the name of “vacant” on a community IRC channel explained the participants have since been asked to solve the puzzles in private, suggesting the end is close for a few lucky ones. 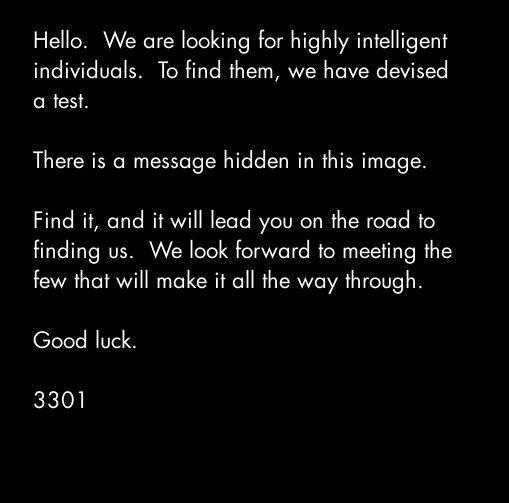 Although no individual or company has yet to claim this ARG (alternate reality game), the complexity of some of these puzzles, including the diversity of locations around the world, suggests this could be backed by a technology company or intelligence agency looking for a few smart hires. Even Microsoft has dabbled in ARGs with the critically acclaimed “I love bees” campaign for Halo 2 and “Vanishing Point” campaign for Windows Vista which even included a trip to space. Unfortunately for the winner of the Vanishing Point never had the opportunity to go as the space-travel company appear to have ceased its operations. Hopefully the winner of this ARG gets a much more tangible prize. Nope. Dark internet is what I meant. It’s where you use TOR to basically access a webserver directly that’s not listed in any internet DNS. No, you really meant darknet. Chunks of “dark internet” which that article refers to are either firewalled portions of the clearnet or areas affected by routing errors. Tor’s onion address system is a rudimentary darknet, not an unroutable segment of the clearnet. However, even the term darknet in its strictest sense would not be correct. In a darknet, only each node only communicates with a set of trusted peers, unlike the tor system in which any node will communicate with any other node (with a few exceptions, but these are very rare). For the purpose of this post, darknet is an acceptable approximation. I confirm. We have made ​​it. The competition isn’t over. Just wait until Jan…..
Where shall we “look” for the next series of puzzles? that it is not an ‘on the level’ entity such as a corporation or business enterprise.It is a nefarious,secret cabal with dangerous political aims trying to assimilate talented people to further their criminal ambitions.One indication of this is the clue that leads to the ‘DARKNET’-this could not be a mistake after all, we all suspect what is down there,don’t we?The kind of people that would spend their valuable time chasing this ‘will-of-the-wisp’ are not hired by orgs like the CIA or FBI.Having said this however, I do not discount, foreign to the USA powers,intent on challenging the dominance of the NSA.As a last thought would a legitimate org like GOOGLE be the perp??? Hello everybody, I hope you guys don’t mind if an Aussie joins in the fun. I am not into cryptographic stuff, I find that those who do such stuff are mostly linear thinkers; I on the other hand am a lateral thinker and therefore I chose to find Cicada by other means. Not by their codes, puzzles or silly pictures but rather by their “arrogance” in believing themselves to be so smart. The cicada is the biggest clue of all … the prime numbers, book of law, the mentions of things occult, religion and so on .. they all do indeed point to a secret society, one that is not too old .. and its emblem carries the cicada within it. What would that be? Here is picture for you all, before you click it please take one last look at the picture of the cicada then click on the link below .. and you should see it straight away. I only been at it for a few short days, shall come back soon. I realise this is not the end of all things but I thought you guys might like a new way of looking at these people. Sorry, I forgot to add something else and could not re-edit my last comment.. This link has nothing to do with Cicada 3301 .. but it does make mention of something special. I took it a bit further … those who cracked the code have been invited to wait at a Tor site….. here is all the info you need to make your way there. Also, one of the new recruits has obviously refused to break contact with others and has left a trail of crumbs … I’m turning pigeon for a while. i cant wait for more clues!